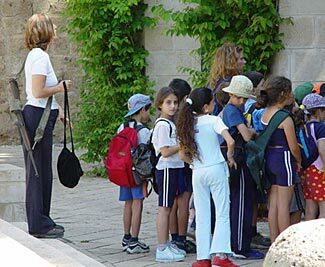 There’s a reason you never hear of terrorist attacks on Israeli schools. As I write this, the country is going through a histrionic act of soul-searching after the Sandy Hook Elementary School shooting in Newtown Connecticut last week. Gun grabbers can barely hide their glee behind a veil of crocodile tears, and the rush to enact more gun control legislation is terrifying in its irrational intensity. The biggest problem with gun control? There’s too much of it. There’s a reason that people choose to shoot up schools – because they are ‘soft targets’. Where else can a crazed gunman be sure to find a lot of helpless defenseless people, with no danger of anyone having a gun and shooting back? Rather than take more guns out of the hands of law abiding citizens who use their guns exclusively for good and never for bad, why not change the prohibition on guns in schools and instead mandate that teachers take small arms defensive training and be issued with firearms. We require teachers to spend many years of their lives training in how to teach – why not have them spend another week learning not just how to educate our children, but also how to protect them while they are responsible for the safety of our children. And let’s now look at an interesting statistic that puts our so-called violent culture into a truer perspective. As we’ve written about before – see here and here, for example – our rates of violent crime are massively decreasing and now are at about half the levels of when they were at their worst. During these last twenty years or so, we’ve not seen any abatement in unemployment, gangs, drug related activity, and so on. But we have seen massive increases in gun ownership and massive improvements in the laws that formerly sought to restrict our ability to own, carry and use firearms in self defense. The conclusion is inescapable. More guns and a more realistic approach to their use, equates to less violent crime. Now, for the really telling comparison. Please read this article which compares rates of violent crime in various European countries. Near the bottom, it also shows the rate of violent crime in the US and Canada. Here in the US, we have a rate of about 466 violent crimes per 100,000 of population. Up in gun-hating ‘peaceful’ Canada, the rate is more than twice as high! 935 violent crimes per 100,000 of population in Canada. Now go to Europe, and while a few countries have lower rates, look at the countries with hugely higher rates, including, worst of all, the ultra-gun grabbing country of Britain, with a rate of 2,034 violent crimes per 100,000 citizens – almost five times the rate in the US. These are the real numbers that count. Sure, 20 dead children is an emotional event that upsets anyone with children (including me). But that is a rare occurrence, and it happened in a state that is already very restrictive in its gun laws, and in an area where people weren’t allowed guns. How many laws did that gunman already break? Enacting new laws won’t be any more effective at preventing him than all the laws already in place. These children died because of too much gun control, not because of insufficient. We need to empower and equip schools and teachers with the tools and skills they need to make schools ‘hard targets’ rather than soft ones. And, most of all, we need to preserve our invaluable Second Amendment rights, so we as citizens can protect ourselves wherever we are (including in school grounds) and so we as citizens can do our bit to keep the violent crime rates falling still lower and lower. For sure, George Bush was a controversial President and attracted a huge amount of criticism (and, alas, not all of it unjustified). But do you ever remember reading a headline ‘Left Wingers Continue to Mean-Spiritedly Nitpick at President Bush’? Now look at this article, prominently featured on Yahoo and elsewhere, but with two key words changed : Left becomes Right, and Bush becomes Obama. This article is an appalling example of media bias, from the headline, to the content, and even to the gratuitous insults offered to conservative politicians at the end. In the interest of fairness, let me match the lack of history knowledge by a congresswoman with Obama’s reference to ‘all 57 states’ – he doesn’t even know how many states there are in the United States! And let me match Sarah Palin’s hand notes with Obama’s slavish reliance on a TelePrompTer wherever he goes – a total inability to deliver unscripted speeches. But you won’t see any of this in that article. Instead, in a desperate attempt to defuse the shameful silence on Obama’s part regarding Easter (click the link for an excellent article on that), and to try and pathetically explain why he enthusiastically talks up Muslim religious holidays instead, the article and its writer does what the left wing has become so skilled at – it attacks and insults the conservatives, rather than choosing to enter into a fairminded debate about the issues. And that is probably why you’re here, reading this. Thank you. Here’s an interesting couple of videos – the first being an interview with a homeowner in the Denver CO area who was forced to defend himself against three intruders who broke into his house one night. At least one of the intruders was armed; the homeowner defended himself successfully with his own pistol, and subsequently was interviewed on a local news program. The second interview is with the Denver District Attorney who explains why, according to Colorado law and the facts of that particular case, he decided the shooting was justified – note in particular how one of the two reporters was trying to feed him a line about it being a vigilante shooting, and his very reasoned and rational response. His decision as to this being a justifiable act of self defense of course probably would not apply in other states and/or in other situations, but it gives you some insight into the way the legal mind works in reviewing a home defense situation, as well as insight also into how you may react and what you should expect. Also on the linked page is some commentary from Front Sight founder, Dr Ignatius Piazza, on the situation, and about how it is generally better not to agree to a television interview after being involved in an incident such as this. I was interested in the handgun that was used – a Taurus Judge – a five chamber revolver that shoots either .410 shotgun shells or .45 ‘Long Colt’ (not regular ACP) rounds. The shotgun shells need to be short 2.5″ long shells, rather than longer 2.75″ or 3″ (although Taurus now make a model that will handle the 3″ long shells too), and can have various different loads in them. The 000 buck rounds hold just three balls (in 2.5″ length). This review isn’t very positive about the Judge in terms of self defense, although it seems likely that it could be effective as at least a ‘scare them away’ weapon; perhaps loaded with the Number 4 shot, which very rapidly disperses to cover a large area. I’ll try shooting one some time to let you know what the recoil is like – my guess is that it packs an awful punch. Why Do the TSA Need 3.454 million Rounds of Pistol Ammo?